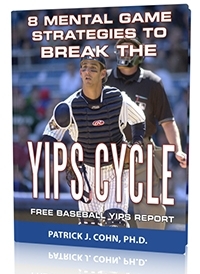 How do you go from dominant pitcher to a pitcher who has the yips and is anxious about pitching? This is the real life story of Lacey Waldrop, pitcher for the Chicago Bandits of the National Pro Fast-Pitch women’s softball league. As a junior at Florida State University, Waldrop had one of the best statistical seasons in program history. Waldrop posted a 38–7 record with a 1.13 ERA and 287 strikeouts and received several post-season awards: first-team All-American, ACC’s Pitcher of the Year and the USA Softball National Collegiate Player of the Year award. Waldrop was dominant and lead the Seminoles to an ACC title and the program’s first Women’s College World Series appearance since 2004. But something changed at the start of her senior year in 2015… Waldrop’s confidence started to wane. Sometimes players can lose confidence with one poor outing. During Florida State’s first tournament in 2015, Waldrop’s throwing motion did not feel as fluid and natural as it did in previous seasons. Waldrop started throwing the ball way outside of the strike zone, into the dirt or far over the catcher’s head. Some of Waldrop’s pitches were so off course that she hit the opposing hitters. Waldrop felt helpless and just couldn’t throw her best pitch for strikes despite the encouragement from her FSU coach Lonni Alameda. The yips appeared to have taken hold of Waldrop and the routine task of throwing the ball seemed like an arduous chore. The mounting pressure of having the yips just served to exasperate the mental issue. Due to her pitching woes and the mental struggles of pitching, Waldrop spoke to Alameda and sports psychologist to try and fix the problem. The harder Waldrop tried to fix the problem, the worse it got. Waldrop had her breakthrough when FSU played the University of Tennessee in the winner-take-all Super Regional contest. It was this game that Waldrop identified that she took back control of her mind. Waldrop’s persistence paid off as she was selected the third overall selection in the 2015 NPF draft by the Chicago Bandits. In her professional debut, Waldrop displayed her old form as she tossed a complete-game, one-hitter against the Akron Racers. Waldrop uses her yips experience as evidence that she can overcome whatever obstacles land in her way. How did you handle your performance dips? Did your mental approach add to the problem or help you overcome the issue? Did you coaches help or hinder your progress? How would a new mental approach help you through the tough times? If there are other athletes who have been in your situation and rebounded, then so can you. 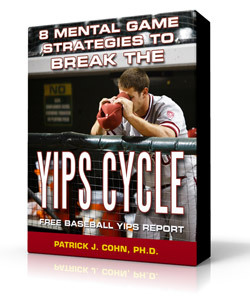 You can learn from other players who dealt with the yips. What have you been currently doing that has worked or made the problem worse (overthinking, over-analyzing, tinkering with technique, allowing distraction to enter your mind, etc.)? Many athletes wait it out and expect their performance to return to normal. Don’t wait until your performance returns to normal. What can you do to overcome these contributing factors? Whether it is relaxation techniques, meeting with a sport psychologist or talking to athletes with similar experiences, think of some proactive steps you can employ to take back your mind. For now, go back to what’s worked in the past for you instead of searching for the secret–that might not exist. 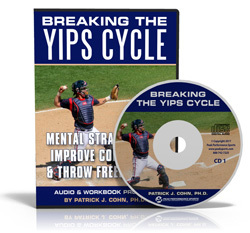 Want to learn more about the throwing yips? Love seeing stuff like this! So happy for her and I actually faced the Yips as a catcher for 4 years and this year I got rid of it! I can relate to many things she explained and never give up because hard work does pay off in the end!